A medium spiced curry sauce with tomatoes and double cream. 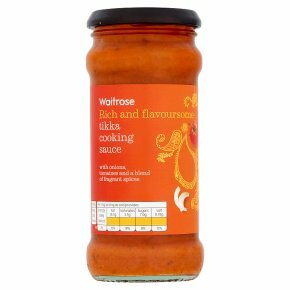 Rich and flavoursome Tikka Cooking Sauce with onions, tomatoes and a blend of fragrant spices. INGREDIENTS: Onions (26%), water, tomatoes (16%), double cream (milk) (12%), concentrated tomato purée (6%), rapeseed oil, sugar, concentrated onion juice, garlic purée, ginger purée, paprika, maize starch, coriander powder, acidity regulators acetic acid, citric acid and lactic acid, coriander leaf, yeast extract, salt, chilli powder, onion extract, toasted onion powder, dried fenugreek, cassia, allspice, cumin, ginger, cloves, nutmeg, dill, fennel, black pepper, mace, aniseed.